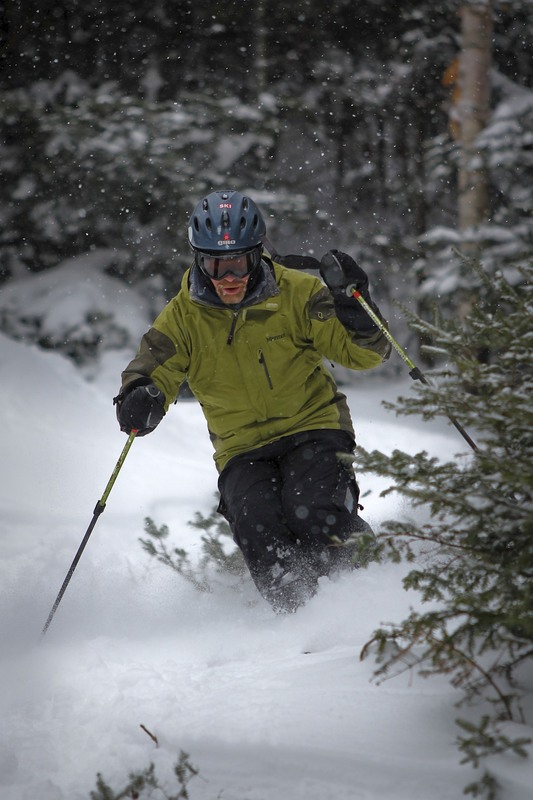 Your's truly enjoying the fresh powder at Mad River Glen during opening day yesterday. Photo courtesy of Riley Hanlon. This morning in Huntington at 8:55AM it’s currently 32 degrees under overcast skies. Winds are calm. Relative humidity is 98%, dewpoint 31, barometric pressure 29.90″ and steady. We picked up 0.25″ of snow and sleet overnight and have 6″ of snow on the ground. 24hr high was (is) 32, low 26. Today we’ll see cloudy skies with scattered rain showers. It’ll be mild with highs 33-37 with light and variable winds. Tonight should be mostly cloudy with scattered evening rain showers northeast, changing to snow showers before ending. Lows will be around 25-32 with wind becoming light out of the NW. New Year’s Day we’ll see some partial morning sunshine developing, then mostly cloudy skies during the afternoon with a chance of evening rain showers. Highs will be in the upper 30s to mid 40s. Sunday night should be mostly cloudy with a chance of rain showers changing to snow showers. Lows will be in the 20s. Monday should be mostly cloudy with snow showers likely north, especially across the mountains. Highs will be in the mid 20s to mid 30s, falling through the day. Last year on this date we had a high of 47 and a low of 25. We had 10.5″ of snow on the ground. Burlington norms for this date are highs of 29ºF and lows 13ºF. Record high was 56 in 1965. Record low was -19 in 1963. Year low was -26 on on January 24th. 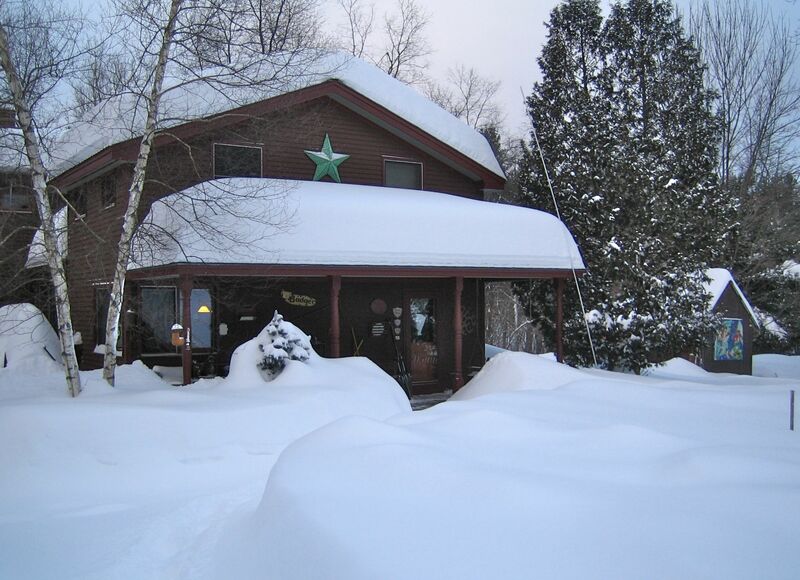 Deepest snowpack was 35″ on March 8. Tomorrow will be 0m 46s longer. The Moon is a waxing crescent, 6d 20h old with 44% illumination. This morning in Huntington at 6:35AM it’s currently 8 degrees under overcast skies. Winds are calm. Relative humidity is 92%, dewpoint 7, barometric pressure 30.08″ and steady. 24hr high was 22, low 0. Snowpack has settled to 6.5″. There is currently a Winter Weather Advisory in effect for our region from 8:00PM tonight through noon tomorrow. Weak low pressure will bring us overcast skies with snow this morning and a chance of snow in the afternoon. 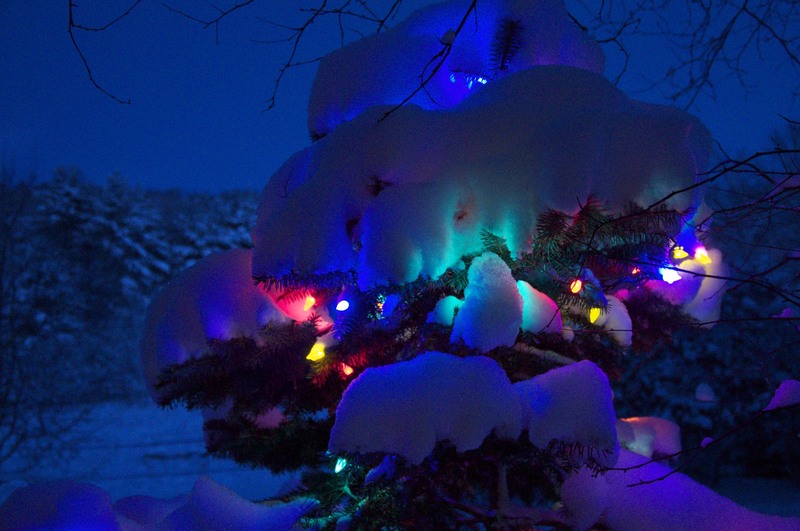 Accumulations should be light – around an inch or less. Highs will be around 37°F with winds from the ESE at 5 mph. Chance of snow is 90%. Tonight should be overcast with a chance of snow in the evening and rain after midnight. Lows will be around 21°F with light winds. Chance of precipitation is 80%. New Year’s Eve should start out overcast with snow showers in the morning changing to rain in the afternoon. Highs will be an unseasonably warm 45°F with light wind. Chance of precipitation is 70%. Saturday night should be partly cloudy with lows of 27°F with winds from the WSW at 5 mph shifting to the NE after midnight. Sunday’s looking mostly cloudy in the morning, then overcast with a chance of rain. Highs will be an (let’s all say it together) unseasonably warm 45°F with winds from the NE at 5 mph shifting to the ESE in the afternoon. Chance of rain is 30%. Sunday night should be overcast with a chance of rain in the evening, then partly cloudy. Lows will be an (grrrr) unseasonably warm 36°F with winds from the West at 10 mph shifting to the NNW after midnight. Last year on this date we had a high of 37 and a low of 12. We picked up 0.25″ of snow and had 11″ on the ground. Burlington norms for this date are highs of 29°F and lows of 13°F. Record high was 57°F in 1982. Record low was -16°F in 1933. Tomorrow will be 0m 33s longer. The Moon is a waxing crescent, 5d 17h old with 33% illumination. High pressure will be in charge today and bring us clear skies this morning, then partly cloudy skies later in the day. 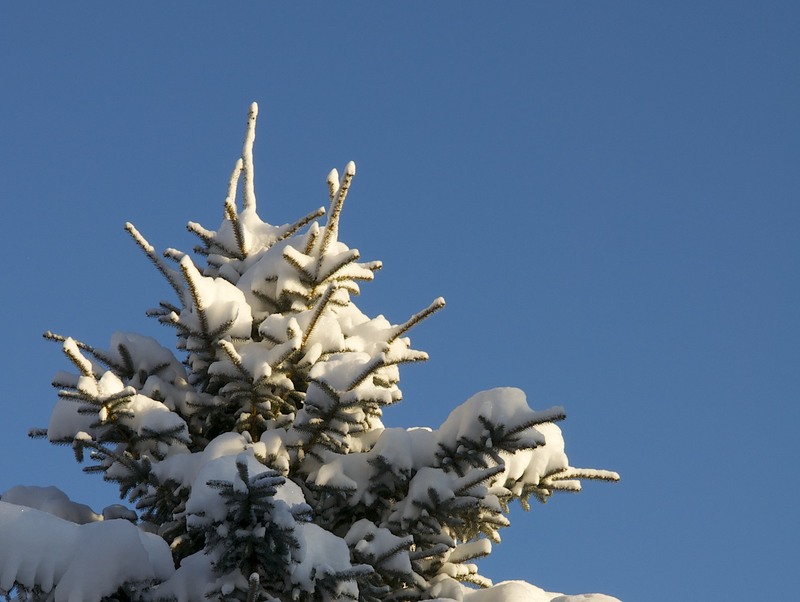 Highs will be a chilly 18°F with light winds. Tonight should be mostly cloudy in the evening, then overcast with a chance of snow overnight. Lows will be around 5°F with light winds. Chance of snow is 50%. Low pressure will move through the region Friday bringing overcast skies with snow showers. Highs will be around 37°F with winds from the East at 5 mph shifting to the South in the afternoon. Chance of snow is 80% with accumulations of a few inches possible. Friday night should be overcast with snow showers. Overnight lows will be on the warm side – 34°F – with light winds. Chance of snow is 70% and there might be some mixed precipitation in there as well. Saturday’s looking overcast with a chance of snow in the morning, then mostly cloudy with a chance of snow. Highs will be an unseasonably warm (I’m getting tired of that term…) 41°F with winds from the SW at 5 mph. Chance of snow is 50%. Saturday night should be overcast with lows of 19°F and light winds. Last year on this date we had a high of 29 and a low of 17. We had 11.5″ of snow on the ground. Record high was 58°F in 1984. Record low was -29°F in 1933. Tomorrow will be 37s longer. The Moon is a waxing crescent, 4d 17h old with 24% illumination. For those of you who subscribe to the blog via email and have to commute back to the Huntington area later today, I just wanted to let you know of a Winter Weather Advisory currently in effect for out area. We’ve seen about 4″ of fluffy snow piling up here already this afternoon and it’s still falling with enthusiasm! VPR has reported numerous accidents on I-89 and roads will be very slick. Windy conditions and blowing snow will make your homeword commute pretty tricky, so please take care on your way home tonight! This morning in Huntington at 6:30AM it’s currently 40 degrees under overcast skies. Winds are out of the southwest at 2-4mph. Relative humidity is 85%, dewpoint 35, barometric pressure 29.24″ and rising. We picked up 0.50″ of rain in the past 24hrs. We have a spotty 1″ of snow left on the ground. 24hr high was 46, low 39. High pressure and an associated cold front will move into the region during the day today. Expect gusty winds to shift into the northwest and temperatures to drop steady during the day. We’ll see overcast skies with snow showers, especially along the western slopes of the Greens. Highs will top out this morning at 43°F. Chance of snow is 90%. Tonight should be mostly cloudy with snow showers in the evening, then partly cloudy. Lows will be sharply colder – around 7°F – with winds from the ESE at 5-10 mph. Chance of snow is 70% with elevationally based accumulations of up to 2-4″ possible by the time dryer air moves in. Thursday’s looking clear in the morning, then partly cloudy. Highs will be around 21°F with winds from the SSW at 5 mph. Thursday night should be overcast with a chance of lightly accumulating snow as an Alberta Clipper moves into the region. Lows will be around 5°F with winds less than 5 mph. Chance of snow is 30%. Friday should be overcast with snow showers. Highs will be around 37°F with winds from the SE at 5-10 mph. Chance of snow is 60%. Friday night should be overcast with a chance of snow. Lows will be around 21°F with winds less than 5 mph. Chance of snow is 50%. We might see a few inches of the white stuff, especially in higher elevations. Last year on this date we had a high of 28 and a low of -5. We picked up 1.5″ of snow and had 13″ on the ground. The Moon is a waxing crescent, 3d 17h old with 16% illumination. This morning in Huntington at 6:30AM it’s currently 34 degrees under overcast skies. Winds are out of the southeast at 3-5mph. Relative humidity is 74%, dewpoint 27, barometric pressure 29.95″ and falling rapidly. We have 4″ of snow on the ground. 24hr high was (is) 34, low 16. Low pressure and an associated slug of warm air is currently moving into the area. We’ll see mostly cloudy skies this morning, then overcast skies with a chance of rain later in the day. Highs will be an unseasonably warm 43°F wiht winds from the SW at 5-10 mph. Chance of rain is 50%. Tonight will be overcast with rain in the evening changing over to ice pellets after midnight. Lows will be around 32°F with winds from the WNW at 10 mph. Chance of precipitation is 90%. Wednesday’s looking overcast with snow showers. Highs will be around 36°F with gusty winds from the SW at 15 mph. 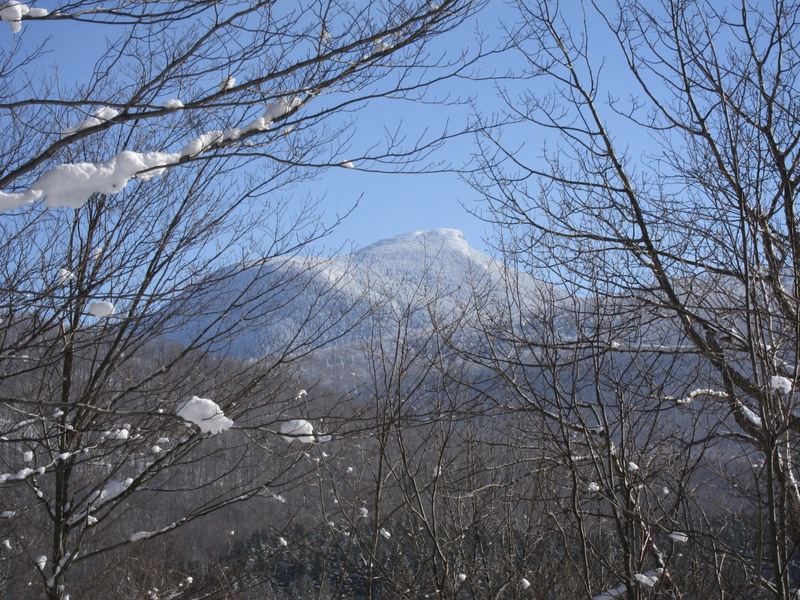 Chance of snow is 80% with accumulations up to 3″ possible in the northern Adirondacks and along the western slopes of the northern Green Mountains. Wednesday night should be partly cloudy with a chance of snow in the evening. It will be sharply colder with lows dropping to -6°F and winds from the WNW at 5-10 mph shifting to the SSW after midnight. Chance of snow is 20% with accumulations up to 2″ possible. Thursday look for partly cloudy skies with highs of 27°F and winds from the North at 5-15 mph shifting to the WNW in the afternoon. Thursday night should be partly cloudy with a chance of snow in the evening, then overcast. Lows will be around 3°F with winds less than 5 mph. Last year on this date we had a high of 12 and a low of 7. We picked up 5″ of new snow and had 14″ on the ground. Record high was 55°F in 1949. Record low was -23°F in 1968. Tomorrow will be 0m 28s longer. The Moon is a waxing crescent, 2d 17h old with 9% illumination. This morning in Huntington at 8:10AM it’s currently 26 degrees under overcast skies. Winds are calm. Relative humidity is 92%, dewpoint 24, barometric pressure 30.11″ rising rapidly. We picked up 2″ of snow in the past 24hrs and have 4.5″ on the ground. 24hr high was 32, low 26. High pressure will move into the region today. We’ll start the day with overcast skies with a chance of snow in the morning, then clearing skies later in the day. Highs will be around 32°F with light winds. Chance of snow is 20%. Tonight should be partly cloudy with lows of 25°F and light winds. Low pressure and warmer temperatures will move into the region overnight into Tuesday bringing us mostly cloudy skies with a chance of rain in the morning, then overcast skies with a chance of rain. Highs will be around 45°F with light winds. Chance of rain is 50%. Tuesday night should be overcast with rain. Lows will be an unseasonably warm 36°F with light winds. Chance of rain is 90% with rainfall amounts near 0.8″ possible. Rain may change over to snow into Wednesday morning bringing overcast skies with a chance of snow as cooler air moves into the region. Highs will still be on the warm side – 39°F – with winds from the SW at 15 mph. Chance of snow is 70% with northern New York and Vermont having the most likelihood of seeing any accumulation. Wednesday night should be partly cloudy in the evening, then clear and sharply colder with lows of -2°F and light winds. Last year on this date we had a high of 14 and a low of -1. We had 10″ of snow on the ground. Record high was 58°F in 1982. Record low was -26°F in 1980. Tomorrow will be 0m 23s longer. The Moon is a waxing crescent, 1d 19h old with 4% illumination.